We had a pretty mellow weekend here. Despite having work to do over the last couple days, Ed was able to enjoy some time with the boys. 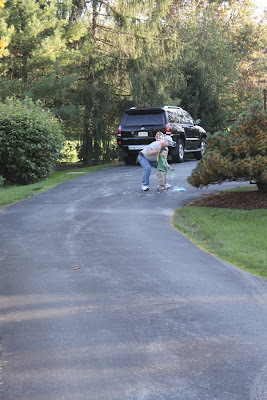 Saturday we brought the boys outside in the driveway and he surprised them with a HUGE bubble wand that he bought. 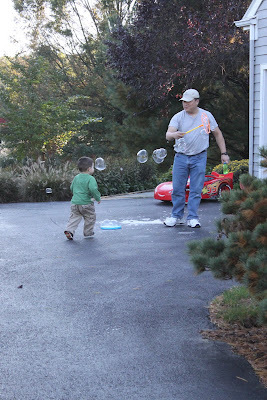 The boys LOVE bubbles!! Brian, especially, was over the moon when he got a private lesson from Daddy. 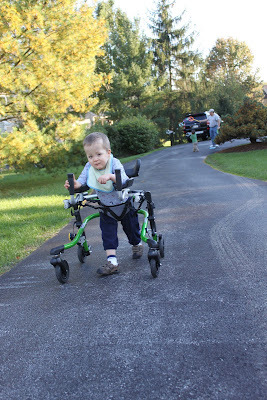 Gavin decided to go strolling in his walker so the two of us took off up the driveway, down the driveway, into the backyard...he was motivated to walk! Today was another nice day so we all took off for a walk around the block. I was optimistic and brought Gavin out in his KidWalk, but he didn't last too long before he pooped out. We went back and got his stroller and continued on. Brian loves walking and is so good holding my hand or staying close to us. Of course we had to stop to shuffle through every leaf pile - and occasionally throw some in the air. Tomorrow I plan to devote a whole blog to the iPad. I'll list the apps we have for Gavin and Brian - let you know which ones I like and which ones were regrettable. If you have an iPad or an iPhone - and if you have a baby or a toddler - special needs or not - this may be interesting to you. I might be way behind the times with apps that may have been out for years...but who knows, you may find one that you like in our pretty big selection! This Wednesday I'm attending an all day conference on using the iPad for special education purposes with several of Gavin's therapists. I'm hoping that I learn something useful so I can be sure Gavin is getting the greatest benefit from this technology. I sometimes feel so bad that it's not something he can turn on and access easily like Brian. Can I ask what cover you use for the ipad. 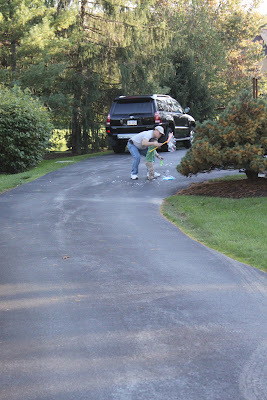 Oh and awesome on the potty training! I cant imagine when we will ever get to doing that but you have inspired me to at least start thinking about it!